The Grand Army of the Republic (GAR) was the principle veteran's organization for discharged soldiers and sailors from the American Civil War. Formed in 1866 immediately after the war ended, they were originally envisioned and a fraternal organization that attempted to continue the fellowship and camaraderie formed by the veterans' common wartime experiences. In the 1880s, the organization, while still fraternal in principle, became more political by lobbying for veterans and widows benefits. Organized along military lines into geographic departments and local posts, there were GAR organizations in every state. They reached the height of their influence in the 1890s and would continue in existence for another six decades. Not surprisingly the GAR Posts made wide use of and had a special reverence for the United States flag, which they defended. 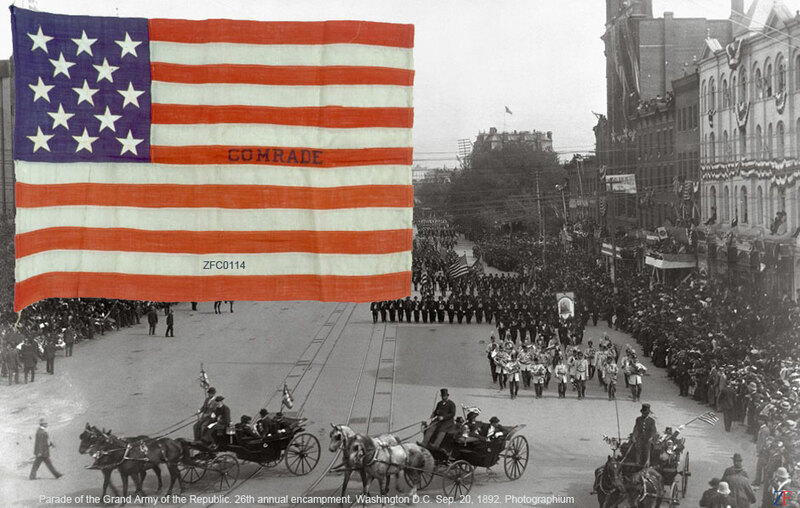 They supported many of the early laws that protected the U.S. flag from commercialization. Presented here are flags and artifacts from both the GAR and their female auxiliary - the Woman's Relief Corps.